“You will become to me a kingdom of priests and a holy nation.”—EX. 19:6. Using the chart “How God Will Accomplish His Purpose” in the previous article, review . . .
1, 2. What protection did the offspring of the woman need, and why? THE first prophecy recorded in the Bible is of great significance in the outworking of Jehovah’s purpose. When making the Edenic promise, the true God declared: “I will put enmity between you [Satan] and the woman and between your offspring and her offspring.” How intense would this enmity be? “He [the offspring of the woman] will crush your [Satan’s] head, and you will strike him in the heel,” said Jehovah. (Gen. 3:15) The enmity between the serpent and the woman would be so fierce that Satan would spare no effort to obliterate her offspring. 2 It is no wonder that the psalmist cried out in prayer to God about His chosen people: “Look! your enemies are in an uproar; those who hate you act arrogantly. With cunning they secretly plot against your people; they conspire against your treasured ones. They say: ‘Come, let us annihilate them as a nation.’” (Ps. 83:2-4) The line of descent of the offspring of the woman had to be protected from extermination and contamination. To accomplish this, Jehovah made further binding legal arrangements that would protect the fulfillment of his purpose. 3, 4. (a) When did the Law covenant go into effect, and what did the nation of Israel agree to do? (b) What was the Law covenant designed to prevent? 3 As the descendants of Abraham, Isaac, and Jacob multiplied into the millions, Jehovah made a nation out of them—the nation of ancient Israel. Through Moses, Jehovah concluded a unique national covenant with them by giving them the Law, and the nation of Israel agreed to the terms of that covenant. The Bible relates: “[Moses] took the book of the covenant and read it aloud to the people. 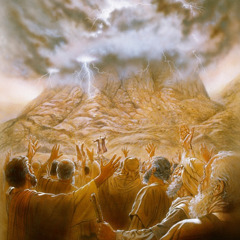 And they said: ‘All that Jehovah has spoken we are willing to do, and we will be obedient.’ So Moses took the blood [of the sacrificed bulls] and sprinkled it on the people and said: ‘This is the blood of the covenant that Jehovah has made with you in harmony with all these words.’”—Ex. 24:3-8. 4 The Law covenant went into effect at Mount Sinai in 1513 B.C.E. By means of that covenant, the ancient nation of Israel was set apart as God’s chosen nation. Jehovah now became ‘their Judge, their Lawgiver, and their King.’ (Isa. 33:22) The history of Israel provides a record of what happens when God’s righteous standards are either observed or ignored. Since the Law forbade intermarrying with pagans and participation in false worship, it was designed to prevent Abraham’s line of descent from being contaminated.—Ex. 20:4-6; 34:12-16. 5. (a) The Law covenant opened up what opportunity for Israel? (b) Why did God reject Israel? 5 The Law covenant also provided an arrangement for a priesthood, foreshadowing a greater arrangement in the future. (Heb. 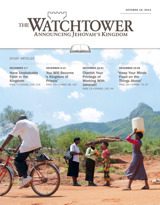 7:11; 10:1) In fact, through that covenant, Israel had a unique opportunity and privilege to become “a kingdom of priests,” provided they met the stipulation to obey Jehovah’s laws. (Read Exodus 19:5, 6.) Israel, however, failed to meet this requirement. Instead of esteeming the arrival of the Messiah, the primary part of Abraham’s offspring, the nation rejected him. Consequently, God rejected that nation. 6. What did the Law accomplish? 6 Israel’s failure to remain faithful to Jehovah and thus supply all those who would make up a kingdom of priests did not mean that the Law had failed. The Law was to protect the offspring and lead humans to the Messiah. Once the Christ came and was identified, the Law’s role was realized. “Christ is the end of the Law,” states the Bible. (Rom. 10:4) The question, though, remains: Who would then have the opportunity to become a kingdom of priests? Jehovah God provided another legal contract to form a new nation. 7. What did Jehovah foretell through Jeremiah concerning a new covenant? 7 Long before the Law covenant was canceled, Jehovah foretold through the prophet Jeremiah that He would make with the nation of Israel “a new covenant.” (Read Jeremiah 31:31-33.) That covenant would be unlike the Law covenant in that it would make possible the forgiveness of sins without the need for animal sacrifices. How would it do that? 8 Centuries later, Jesus instituted the Lord’s Evening Meal on Nisan 14, 33 C.E. Speaking of the cup of wine, he told his 11 faithful apostles: “This cup means the new covenant by virtue of my blood, which is to be poured out in your behalf.” (Luke 22:20) Matthew’s account quotes Jesus as saying regarding the wine: “This means my ‘blood of the covenant,’ which is to be poured out in behalf of many for forgiveness of sins.”—Matt. 26:27, 28. 9 Jesus’ shed blood validates the new covenant. That blood also makes possible the forgiveness of sins once and for all time. Jesus is not a party to the new covenant. Being without sin, he needs no forgiveness. But God could apply the value of Jesus’ shed blood to Adam’s descendants. He could also adopt certain devoted humans “as sons” by anointing them with holy spirit. (Read Romans 8:14-17.) Being considered to be without sin in God’s eyes, they would in a sense be like Jesus, the sinless Son of God. These anointed ones would become “joint heirs with Christ” and have the opportunity of becoming “a kingdom of priests.” This was a privilege that the nation of Israel under the Law could have had. Concerning the “joint heirs with Christ,” the apostle Peter stated: “You are ‘a chosen race, a royal priesthood, a holy nation, a people for special possession, that you should declare abroad the excellencies’ of the One who called you out of darkness into his wonderful light.” (1 Pet. 2:9) How vital the new covenant is! It enables Jesus’ disciples to become the secondary part of Abraham’s offspring. 10. When did the new covenant go into effect, and why not until then? 10 When did the new covenant go into effect? Not when Jesus made reference to it on his last night on earth. For it to go into operation, Jesus’ blood had to be poured out and its value had to be presented to Jehovah in heaven. Moreover, the holy spirit needed to be poured out on those who would be “joint heirs with Christ.” Hence, the new covenant went into effect at Pentecost 33 C.E. when Jesus’ loyal disciples were anointed with holy spirit. 11. How did the new covenant make it possible for both Jews and Gentiles to become part of spiritual Israel, and how many would be in the new covenant? 11 Though the former Law covenant was in a sense made “obsolete” when Jehovah announced through Jeremiah that He would conclude a new covenant with Israel, it did not actually end until the new covenant went into effect. (Heb. 8:13) When that happened, God could view both Jewish and uncircumcised Gentile believers in the same light, since their “circumcision is that of the heart by spirit and not by a written code.” (Rom. 2:29) By concluding the new covenant with them, God would put his laws “in their mind, and in their hearts [he would] write them.” (Heb. 8:10) The total number of those in the new covenant would be 144,000, making up a new nation—“the Israel of God”—spiritual Israel.—Gal. 6:16; Rev. 14:1, 4. 12. What comparisons can be made between the Law covenant and the new covenant? 12 How do the Law covenant and the new covenant compare? The Law covenant was between Jehovah and natural Israel; the new covenant is between Jehovah and spiritual Israel. Moses was the mediator of the former covenant; Jesus is the Mediator of the new one. The Law covenant was validated by means of animal blood; the new covenant was validated by the shed blood of Jesus. And the nation of Israel was organized through the Law covenant under Moses; those in the new covenant are organized under Jesus—the Head of the congregation.—Eph. 1:22. 13, 14. (a) How does the new covenant relate to the Kingdom? (b) What is necessary for spiritual Israel to be able to rule with Christ in heaven? 13 The new covenant relates to the Kingdom in that it produces a holy nation that has the privilege of becoming kings and priests in that heavenly Kingdom. That nation constitutes the secondary part of Abraham’s offspring. (Gal. 3:29) The new covenant thus reinforces the Abrahamic covenant. 14 One more aspect of the Kingdom remains to be established. The new covenant produces spiritual Israel and provides the basis for its members to become “joint heirs with Christ.” A binding legal arrangement, however, is needed to allow them to join Jesus in his Kingdom as kings and priests in heaven. 15. What personal covenant did Jesus make with his faithful apostles? 15 After instituting the Lord’s Evening Meal, Jesus made a covenant with his faithful disciples, often referred to as the Kingdom covenant. (Read Luke 22:28-30.) Unlike other covenants, in which Jehovah is one of the parties to the covenant, this is a personal covenant between Jesus and his anointed followers. When saying, “just as my Father has made a covenant with me,” Jesus was apparently alluding to the covenant that Jehovah had made with him to be “a priest forever in the manner of Melchizedek.”—Heb. 5:5, 6. 16. What does the Kingdom covenant make possible for anointed Christians? 16 The 11 faithful apostles had ‘stuck with Jesus in his trials.’ The Kingdom covenant assured them that they would be with him in heaven and sit on thrones to rule as kings and serve as priests. However, those 11 would not be the only ones to have that privilege. The glorified Jesus appeared to the apostle John in a vision and said: “To the one who conquers I will grant to sit down with me on my throne, just as I conquered and sat down with my Father on his throne.” (Rev. 3:21) Thus, the Kingdom covenant is made with the 144,000 anointed Christians. (Rev. 5:9, 10; 7:4) This is the covenant that forms a legal basis for them to rule with Jesus in heaven. This is similar to a bride from a noble family who might marry a ruling king and come into position to share in his ruling power. In fact, the Scriptures refer to anointed Christians as “the bride” of Christ, “a chaste virgin” promised in marriage to the Christ.—Rev. 19:7, 8; 21:9; 2 Cor. 11:2. 17, 18. (a) Review six covenants that we have considered and that relate to the Kingdom. (b) Why can we have unshakable faith in the Kingdom? 17 All the covenants that we have considered in these two articles relate to one or more vital aspects of the Kingdom. (See the chart “How God Will Accomplish His Purpose” in the previous article.) This fact emphasizes that the Kingdom arrangement is solidly based on legal contracts. We thus have powerful reason to put our full trust in the Messianic Kingdom as the instrument that God is using to make his original purpose for the earth and mankind a reality.—Rev. 11:15. 18 Can there be any doubt that what the Kingdom accomplishes will result in lasting blessings for mankind? With complete confidence, we can firmly proclaim that God’s Kingdom is the only permanent solution to all man’s problems. May we zealously share that truth with others!—Matt. 24:14. Cherish Your Privilege of Working With Jehovah!